Although we’re used to the name Leica being associated with top quality optics but at rather high prices it is refreshing to see their introduction of the new Leica ER 5 series of riflescopes which provide excellent Leica quality but at a price point that is affordable for most of us; in fact prices start below a thousand US dollars. It has seemed quite difficult of late to find top quality European riflescopes that are not encumbered with electronics of some sort or other and consequently priced at rather more expensive levels than they need to be. I’m one of the old school who believes that the more complex one makes something the more there is to go wrong and the shorter its life expectancy is going to be; and that is especially true when you start fitting electronics into things. So when Leica introduced their ER 5 series with top quality Leica optics and no electronics those of us of the old school have been absolutely delighted, and all the more so when we looked at the prices. Lowest power riflescope in the Leica ER 5 line is the 1-5×24. A perfect riflescope for a dangerous game rifle and for most deer stalking rifles. The lowest power model in the ER 5 range is the 1-5×24. This is an ideal power range for any dangerous game rifle and in truth for most deer stalking rifles. Certainly in my own experience out hunting over decades, field of view is all important and shelling out more money for top shelf optical quality means you will see your quarry just as well or better than someone with a lower quality riflescope that has higher magnification. The old European standard deer stalking riflescope was the 1.5-6x42mm which offers an excellent field of view down on 1.5x and plenty of magnification to make even a 400 meter shot on antelope or mountain sheep if cranked up to 4x or 6x. So the 1-5×24 is plenty of magnification for most medium to big game hunting situations. The Leica ER 5 1-5×24 has eye relief of 95mm/3.8″ which is enough for use on a 375H&H, one of the .416’s, or something like a .458 Winchester Magnum; the eyepiece has a rubber cover to protect against “magnum eyebrow” and to ensure your RayBans don’t get chipped. Field of view on 1x is 105’/32m @100m. Leica ER 5 1.5-8×32 is another excellent choice for a deer stalking or general medium to big game hunting rifle and would be perfect for a featherweight alpine or mountain rifle. Next ER 5 riflescope up in the power range is the 1.5-8×32. This is another riflescope that is near ideal for deer stalking and most medium to big game applications. Field of view at 1.5x is 67’/20.4 m @ 100m. With its 32mm objective lens diameter this riflescope will provide a full 7mm exit pupil up to 4x so it can provide good optical brightness in poor light conditions up to that magnification and often above. Given the quality of Leica’s optics this riflescope will likely prove to be able to gather light effectively and maintain a crisp and clearly contrasted image even in difficult light conditions. This is a riflescope that would be very at home on a lightweight hunting rifle especially one intended for alpine hunting or for a trip to New Zealand for Tahr for example. It is a lightweight and compact riflescope with plenty of magnification and light gathering ability perfect for a featherweight hunting rifle. The Leica ER 5 2-10×50 is a riflescope that many if not most hunters will choose. The ER 5 2-10×50 is most likely the model that most hunters will choose because it offers a good field of view on 2x combined with a large 50mm objective lens to draw light in dim conditions. The 2-10×50 provides a respectable 54.25’/16.54m field of view at 100m and even on 10x still provides a 5mm exit pupil to ensure you get the best advantage from the Leica quality optics. The 2-10×50 has become regarded as a “universal” riflescope for most hunting situations and qualifies as a “Jack of all trades”. The 2-10×50 is the first model of the ER 5 series to feature a side focus/parallax adjustment on the left side of the adjustment turret. The parallax is adjustable from 50yards onwards. I’ve seen dangerous game rifles fitted with riflescopes of this power but always in quick detachable mounts such as those by EAW or Talley and I would certainly want to take a riflescope of this power off and use open sights in a close encounters of the nasty kind. Eye relief of all the Leica ER 5 models is 3.8″/95mm so enough for a .375H&H that might warrant having a riflescope of this power on it. The Leica ER 5 3-15×56 is a bit like the old American standard 3x-9x riflescopes on steroids. The next Leica ER 5 model up is the 3-15×56 which provides a decent 36.25’/11.05m field of view @ 100m which is typical of the old American standard 3x-9x magnification riflescopes but with a 56mm objective lens and the ability to crank the power up to a full 15x. This is a riflescope for a heavy sporting rifle which might be called on to do woods deer stalking duty but is also used for smaller quarry at long range. It would be equally at home on a 22/250 or a 7mm Remington Magnum and all the shades in between. This riflescope tips the scales at 25.5 oz/720g and at three quarters of a kilo it is certainly going to turn your sporting rifle into a heavy sporter as soon as you fit it. But the sheer optical performance may make that exactly what you are looking for. A great riflescope for stand hunting and twilight or moonlight hide hunting. This model features a side focus/parallax adjustment dial on the left side of the scope. 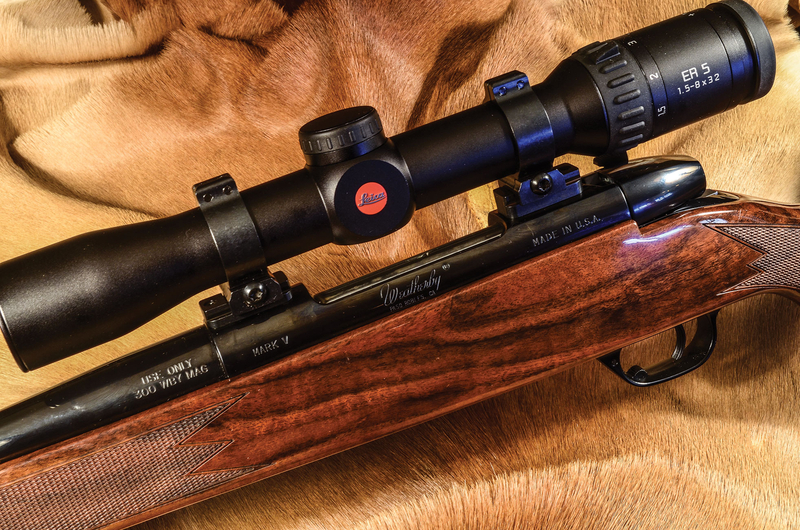 The ER 5 4-20×50 gets up into benchrest and precision rifle magnification territory. This is very much a varmint riflescope or a unit for an extreme range rifle. The ER 5 4-20×50 is a rather more specialized riflescope primarily at its best either for small to medium game at extended ranges or for target range work. Back when I was shooting competitive benchrest I used a 20x riflescope most of the time; it provided sufficient magnification without over emphasizing mirage so this is a good level for a long range rifle. Weighing 23oz/650g this riflescope is a bit lighter than the 3-15×56 and can be mounted a little lower on the rifle. A great daytime and evening longer range riflescope with a field of view of 27.25’/8.31m on 4x @ 100m. This model also features a side focus/parallax adjustment and can be set parallax free from 50yards onwards. The ER 5 5-25×56 is the biggest of the ER 5 series riflescopes and is a highly capable unit for long range day or night shooting. The largest of the Leica ER 5 series riflescopes is the 5-25×56 which is a highly capable unit and interestingly manages to be slightly lighter than the 3-15×56, tipping the scales at 24oz/680g. This model also features a side focus/parallax adjustment from 50yards on out. 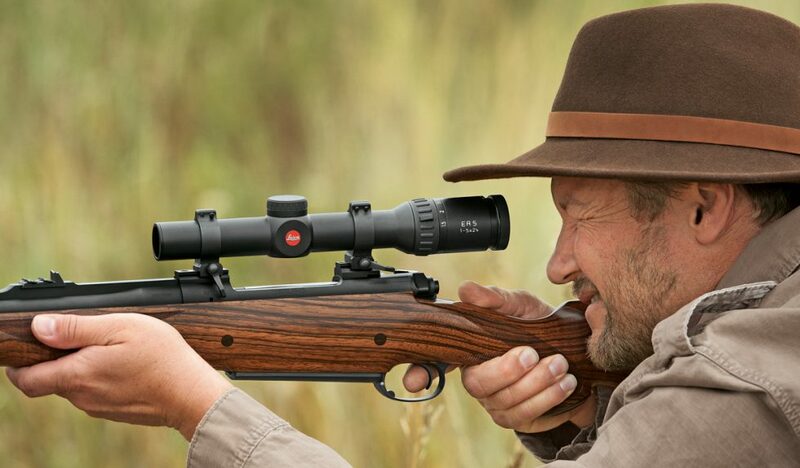 The Leica ER 5 riflescopes are provided with a choice of six reticles to suit whether the riflescope is to be used for dangerous game, general stalking, long range hunting or target shooting. Leica make six reticles available for their ER 5 series riflescopes and choice of reticle will depend on what you are planning to use the riflescope for and what your personal preferences are. Those of us of the old school will likely go for the German 4A or the Plex but the other reticles have their advantages depending on what you want the reticle to accomplish. The Plex is the old fashioned “sniper” reticle whilst the German 4A provides three fairly heavy posts with a cross hair. Both achieve the same end which is to provide heavy posts that are easy to pick up even in poor light with a medium crosshair to enable precise shot placement. The German 4A has a wider sized gap between the heavy bars by comparison with the Plex. The reticle subtensions are useful for range estimation when the reticle is in the first focal plane (i.e. “magnifying reticle”) so the reticle subtensions remain the same regardless of magnification. The German 4A is good for dangerous game and driven game such as driven wild boar. 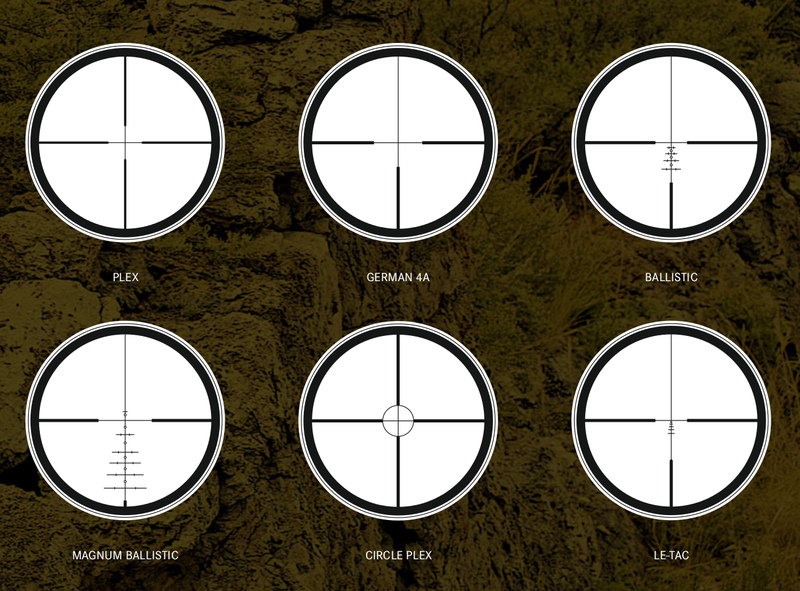 The Ballistic reticle provides guidelines for range estimation and windage. The Ballistic reticle’s multiple aiming points allow for a fairly easy way to use a long range zero but still have distinct aiming points for shorter range shooting. The Ballistic is intended for standard calibers whilst the Magnum Ballistic is intended for long range flat shooting magnums such as the 7mm Remington Magnum and the .300 Winchester Magnum etc. The Circle Plex is a reticle for instinctive snap shooting and good for use on a dangerous game rifle or one used for driven game hunting. This reticle is also good on a shotgun and is at its best used at low magnification with maximum field of view. This reticle is specifically intended for use on tactical rifles chambered for the 5.56mm NATO or similar. The graduations are intended to match up with 5.56 NATO and .223 Remington ballistics. With prices starting under a thousand US dollars the Leica ER 5 line of riflescopes offer Leica quality for very reasonable money. Leica ER 5 1.5-8×32 mounted on a Weatherby Mark V in .300 Weatherby Magnum. (Picture courtesy grayssportingjournal.com).